Welcome to a world where having a gift makes you Extraordinary! It’s the War of 1812 and Napoleon isn’t the only enemy… and definitely not the only enemy with a few Extraordinaries on their side! Time to even the odds! Let’s meet Elinor, shall we? Elinor is a Scorcher. She can set anything on fire at will and extinguish any attack. Her fire ability not only makes her a worthy opponent at war, but she’s also able to fight the battle of wits as she puts men in their place! However, her father wants to marry her off so he can profit and reap the rewards of her talent. He has no care or thought as what she thinks or how she feels about this. So… she must take her life and her fate in her own hands. Her father told her she had two choices, marry who he picks or be dependent on him and will make no allowances. By forcing her to choose between these two options, her father (inadvertently) forced her to create a third option. What a choice it was! She joins the Navy… at a time when there were no women in the military, a time where you were still considered property of your husband. 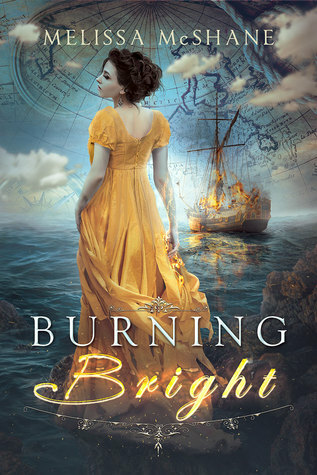 Elinor has made herself pretty useful to the British Navy, but not without trials and tribulations! Those without gifts are either jealous or afraid of those with gifts. But Elinor has no ordinary fire ability! She’s quite possibly the strongest Scorcher in history to date. Captain Miles Ramsey is no slouch in the Extraordinary department either. He’s a Mover! (yep, exactly what it sounds like… and he can fly with this ability) How cool is that?! Together, can they defeat the pirates (who have gifts of their own) and Napoleon? The writing and character development were great. Elinor started off as a timid young woman who just wanted to appease her father because he scars her. Through her experiences with the Navy, she becomes strong and independent. The world creation was explicit and well done. I felt as though I was standing on deck with Captain Ramsey awaiting orders. While there was a romance aspect to the story, it wasn’t a major part. It was truly amazing to read a story about a young woman grabbing by the lapels and saying, “We’re doing this MY way!” It was a great read and I look forward to book 2!